In 2010, the people near Birch Creek, Michigan heard a boom and felt the earth rock. They woke up the next morning and found a huge crack in the ground. What caused it? A team of researchers finally believe they know. The first clue was the fact that the split happened at the top of a ridge. A pop-up isn’t a wrenching apart of some deep underground structure. It’s a large piece of ground suddenly pushing upwards, so that the ground above splits over it. The researchers discovered the pop-up by the sophisticated technique of slamming a sledgehammer against a metal ball sitting on the ground. The action caused sound waves to move through the rock beneath—and depending on the formation of the rock, the sound moves at different speeds. In this case, it moved in hugely different ways parallel to the crack, as compared to perpendicular to the crack. This indicated that there was a huge fracture in the limestone underneath the crack. These sudden fractures occur due to extreme strain in the rock—strain that can be pent up for centuries. It’s more common around quarries, when removal of large pieces of rock can cause the rest to suddenly fracture and pop upwards. Other times, it can occur spontaneously. 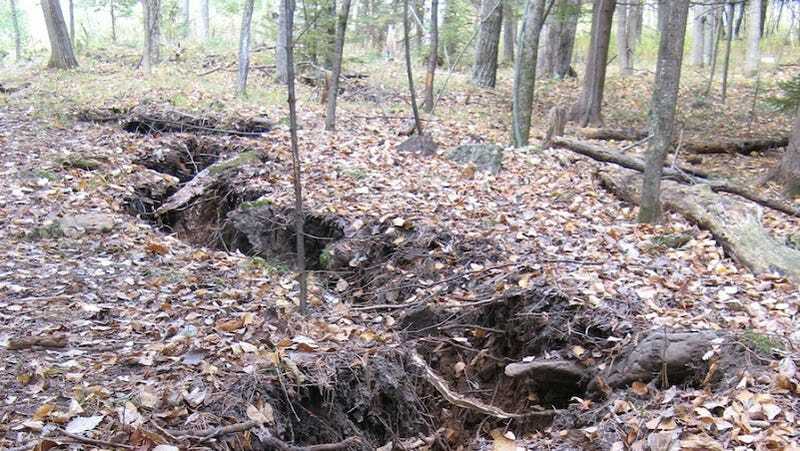 The Menominee Crack, as its now called, was probably the result of a spontaneous fracture—although the researchers speculate it might have happened due to the removal of a large tree from the area. Perhaps the citizens of Birch Creek angered a dryad.